With the advent of smartphone usage and more so with bigger screens being the norm, using browsers has become far more delightful than ever before. Given the fact that keyboards like Swiftkey and such are getting smarter, going free and also support many different local languages, it only helps increased usage of the browser for many different things. However, there are also a flurry of apps every single day that will carry out one primary task for you and the usage of browser in many cases has decreased, with many portals taking the app only approach. When this is the case, it takes a lot for a company making browsers to attract users towards adopting them. One of the popular browsers out there is from the Alibaba folks, called the UC Browser. While on the global scale Google Chrome still remains to be the #1 with a big lead, however in countries like India and China, UC Browser seems to be the top with a huge lead. If you observe, the trend for UC in India is only getting better. With more than 50% market share, it will be really hard for Opera at 2nd and Chrome at 3rd with around 20% and 14% market share respectively. This has also got to do with the fact that lots of Chinese phonemakers sell phones in India that ship with UC browser out of the box. UC browser currently ranks at #2 position amongst the ‘Top Free‘ apps on Google Play Store in India, after WhatsApp. So what makes UC Browser so popular? Lets find out! UC browser performs like a bullet train as webpages load up blazing fast. It speeds up loading of websites by compressing the data and blocking various ad scripts from loading thereby delivering a super fast browsing experience that helps in saving Internet bandwidth too. The built-in ‘Cloud boost‘ technology saves data and improves loading time by sending data to UCWeb servers for compression. Excessive ads on a webpage specially the intrusive ones and pop-ads can be really annoying at times. UCB blocks such ads by default thereby speeding up the web browsing. 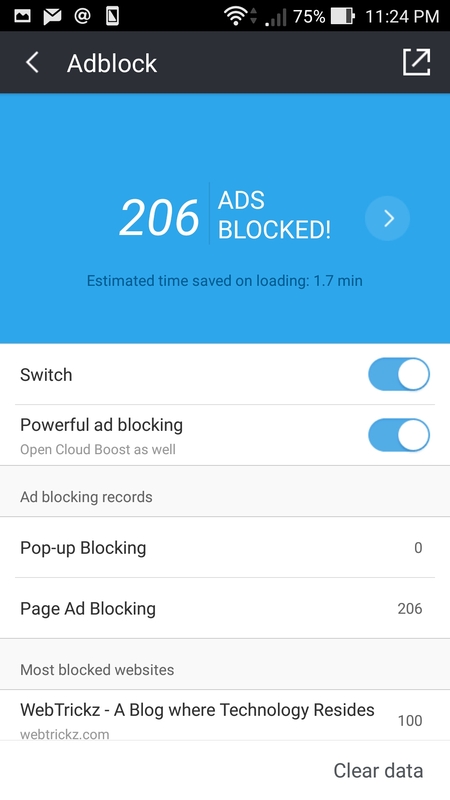 One can also check the number of total ads blocked and total ads blocked on specific websites. You also have the option to disable adblock add-on anytime. 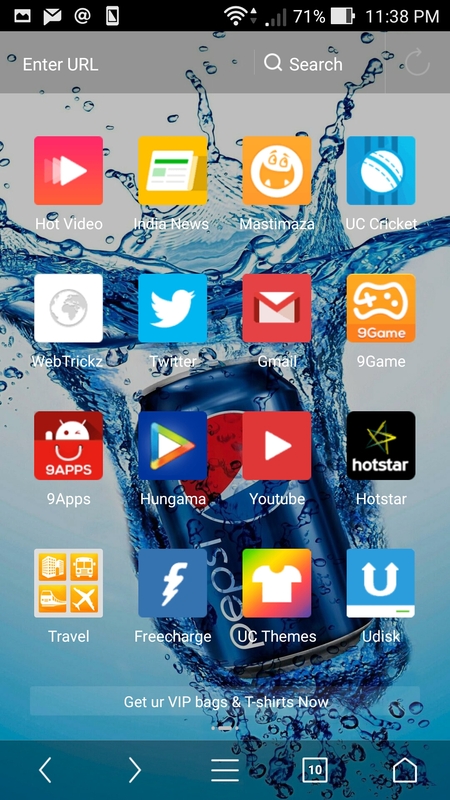 Most of the browsers have their common controls on the top of the bar but UC Browser has it at the bottom. This is such a neat feature especially with the phones getting bigger and single handed usage becoming such a challenge. All the options like Forward, Backward, entry to Options, number of tabs and home page is neatly laid out at the bottom and this is reminiscent of the iOS style apps where one can find all the options at the bottom. This might sound very trivial but if you’re someone who uses browsers a lot on mobile, this is a delight. Full Screen : Switching to full-screen mode hides all the unwanted elements from your screen except the browser making the most display space available for browsing seamlessly on phone. The status bar gets hidden thus offering a distraction free experience. Fit to Screen : Some websites are not optimized for different screen sizes and pose a challenge to the users to view the information. One would have to pinch or zoom or move the position which becomes cumbersome. This option would fit everything into the screen for you to know of the full content and their position. Remember those times when you entered some info in a page and were struggling to find the “Submit” or “Done” button? this is just the option you’d find yourself using. Text-only : At times when the network signals are low, pages take a while to load up with those embedded images and videos. This option comes in handy if you’re looking for some information that is just text. This option also helps you in case you want to save data usage over network and have the images downloaded over Wi-Fi only. Account creation : Logging into a UC Browser account is as simple as logging in via your FB or Google account. There is no mandate to login but this does help in pushing and retaining your preferences across devices. One of the things that people love to do, and also find it very interesting is to “personalize” the apps they use. 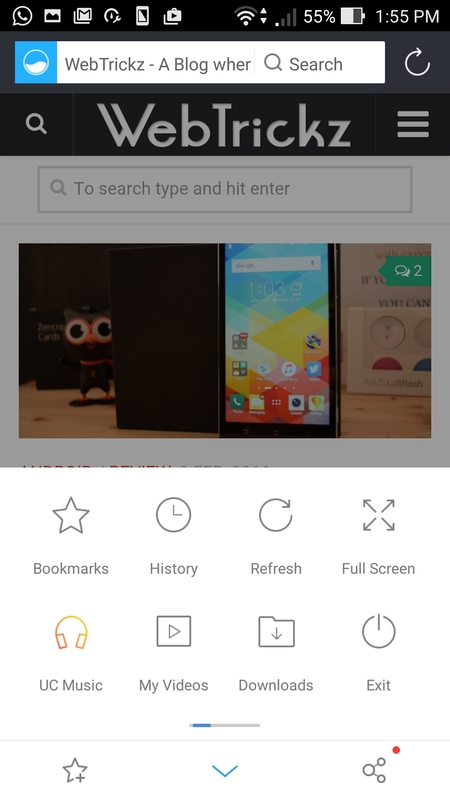 UC Browser brings that option on the mobile. You can use the “Theme” option to completely change the look and feel of the browser. It is beyond changing the look of the home screen background but each and every component gets adjusted accordingly. What we loved is that it works well without any issues. 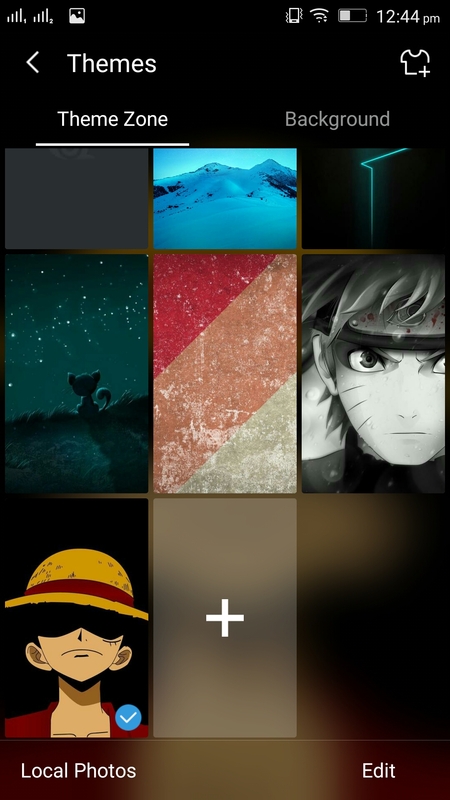 Upload a picture of your choice, or download one of the online themes or use one of the standard ones. Browsing can lead to some interesting pages that we continue to read on for elongated periods of time. At times this could be while on a journey or during the night when some interesting topic grabs your attention. Of course many phones in the recent past come with the read-mode but that changes are for the entire set of apps. So instead you wanted to use it for the browser only, UC has it covered with the Night Mode option where things go a little dark and less strain on your eyes. We tend to download a lot of stuff off the internet but we also traverse through various network conditions. At times the priority of downloads too vary. Having a good control over things like number of maximum downloads, managing the traffic, monitoring and keeping a tab on the downloads made on mobile data vs Wi-Fi – all of these become very essential if you have to manage the monetary aspects around internet usage. The landing page for a browser is very important and UC has one of the best we’ve seen since a long long time. Tiny widgets called the “Cards” occupy the home page allowing quick access to the websites you’re more likely to visit often. There is a complete set of pre-defined cards you can choose from or define the ones you’d want using the “Add URL” option. At the top is the space to enter a URL or make a search. Swiping back and forth will take to 3 pages. One that pulls up the latest news of the location, the other with the cards on it and then the final one with the data usage details. All this is very well thought out set of information. 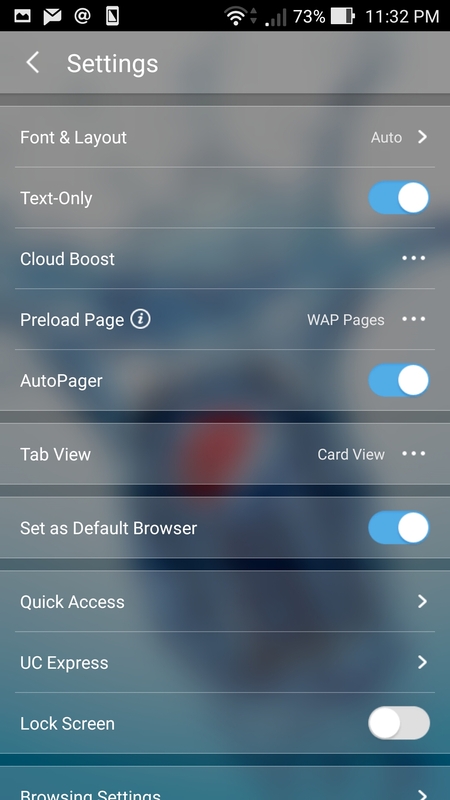 UC Browser is a unique blend of intelligence, delight and freedom : all working in tandom to turn your usage into a delight. 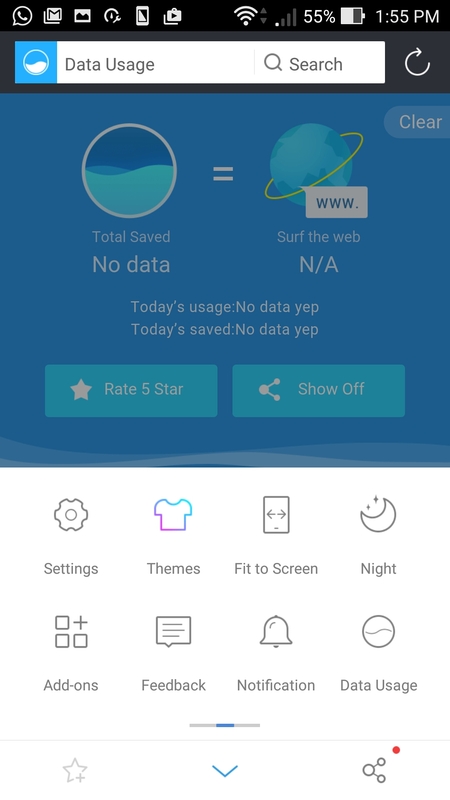 From gestures to well positioned options, from data usage monitoring to customization this is one browser that you must give a try and we feel there are at least 3 things about it you will fall in love with.